Pick any common saying in western culture, and chances are good that there's a Korean equivalent that involves rice cake (lovingly called dduk in Korean). The grass is greener on the other side? Check. The other person's rice cake always looks bigger than the one you're holding. As easy as pie? Check that too. 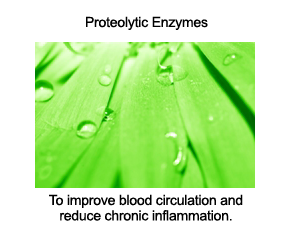 As easy as lying down and eating rice cake. Turn the other cheek? Give your enemy one more piece of dduk. Nice people finish last? Give someone a piece of dduk and get slapped in return. Really, these are well known sayings in Korea. Feel free to confirm with your friendly neighborhood Korean who grew up in Korea. You want more sayings that involve Korean rice cake? Ask my father and he'll give you ten in a minute. Here's my point: Koreans love rice cake. And what's not to love? 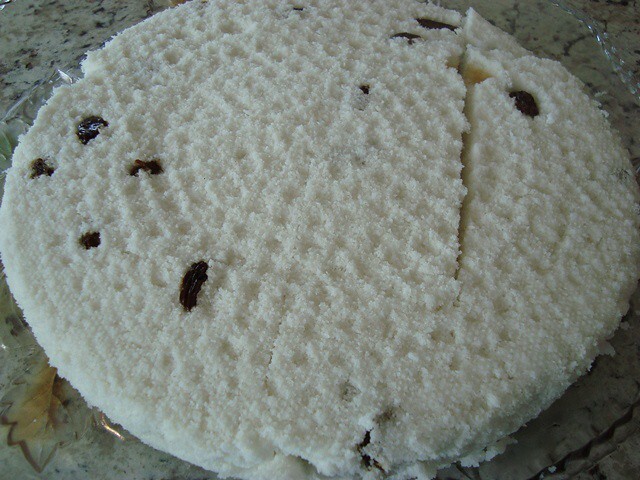 Korean rice cake - the kind that comes out soft, chewy, and with just a hint of sweetness - provides a highly unique mouthfeel compared to modern day fluffy cakes. 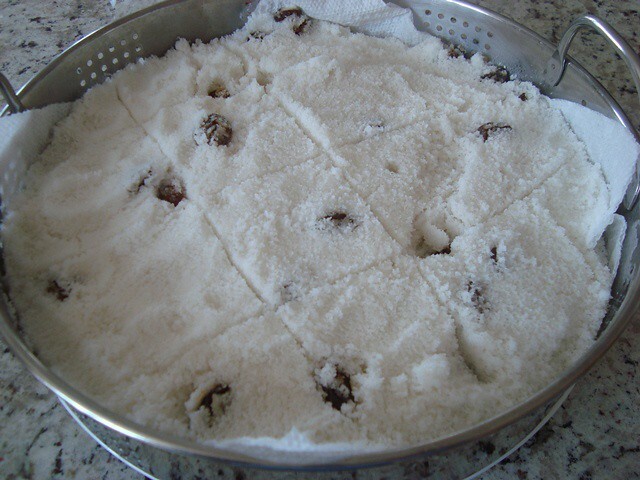 And lucky for me, my mom is a true master at making traditional Korean rice cake. Mind you, it's not a perfectly healthy dessert choice. 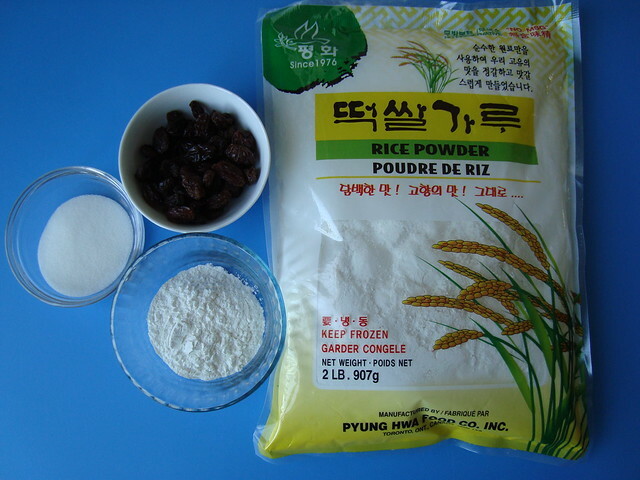 The main ingredient is rice powder/flour. 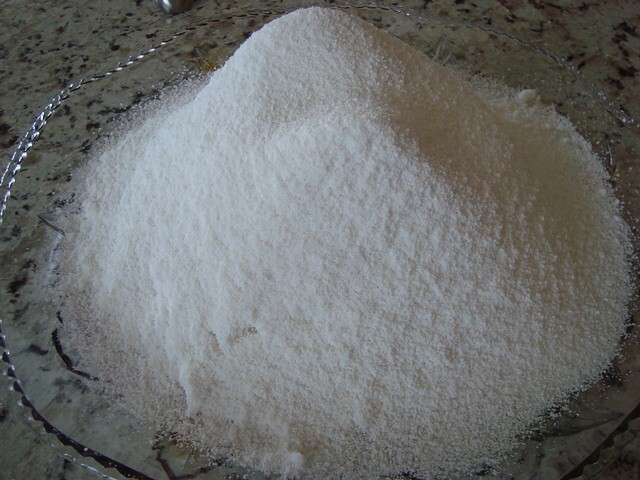 And it does call for some sugar, though not much compared to most modern western cakes and pies. 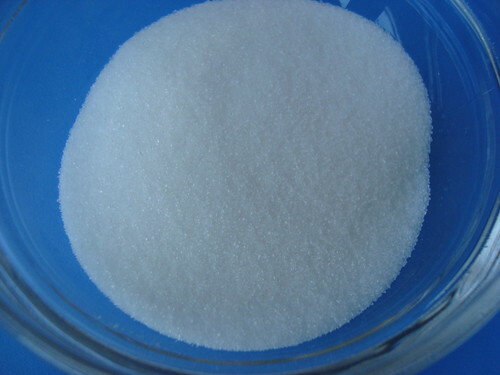 Even if you use a natural sweetener, Korean rice cake isn't as good for your cells as, say, a bowl of sweet mango chunks and creamy avocado slices. But let it be clear that this post isn't about how to make another perfectly healthy dessert. 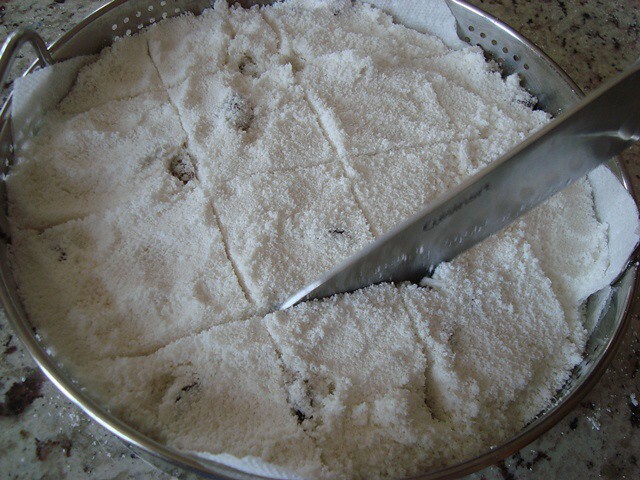 This post is about how to make Korean rice cake just like my mom makes it for us about once every six months. And if you follow this recipe and enjoy Korean rice cake once in a while with loved ones, may you bask in the glory of celebrating authentic Korean cuisine. 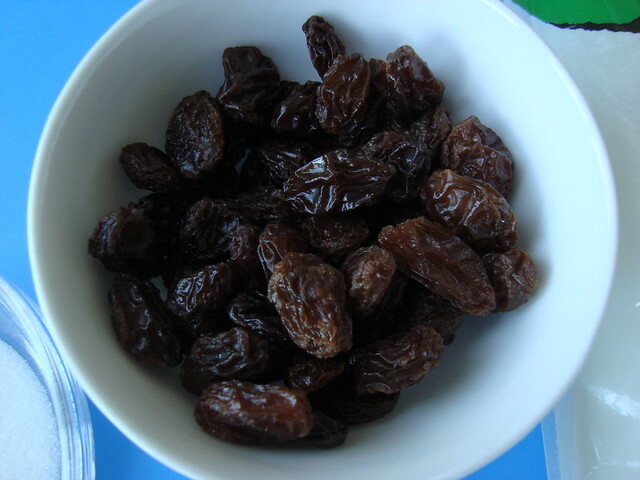 Three to four tablespoons of organic raisins (less if you want less sweetness, more if you want more). 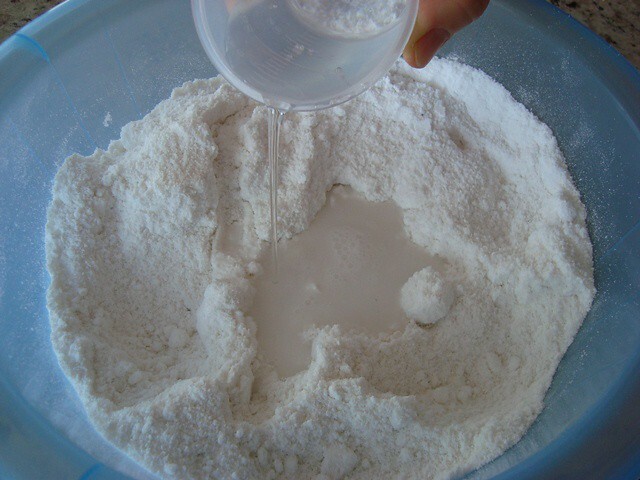 Two tablespoons of sweet rice flour (chap ssal ga roo), also available in any Korean grocery store in the dry foods section. 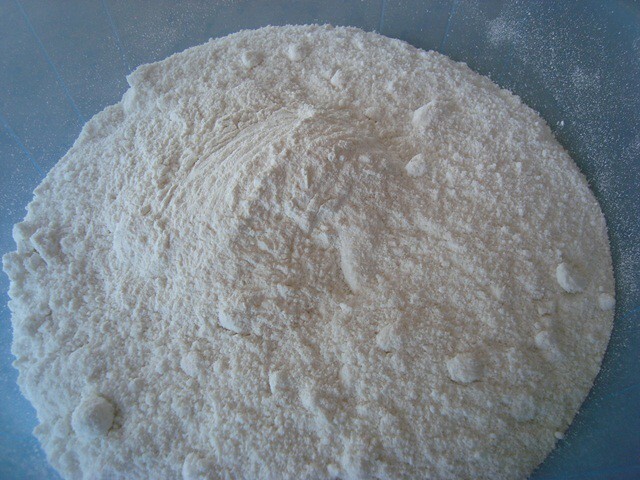 This is sometimes called glutinous rice flour. 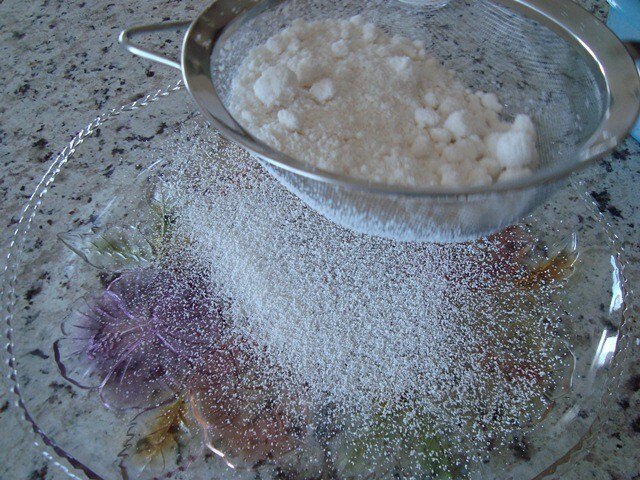 Two tablespoons of a powdered sweetener of your choice. 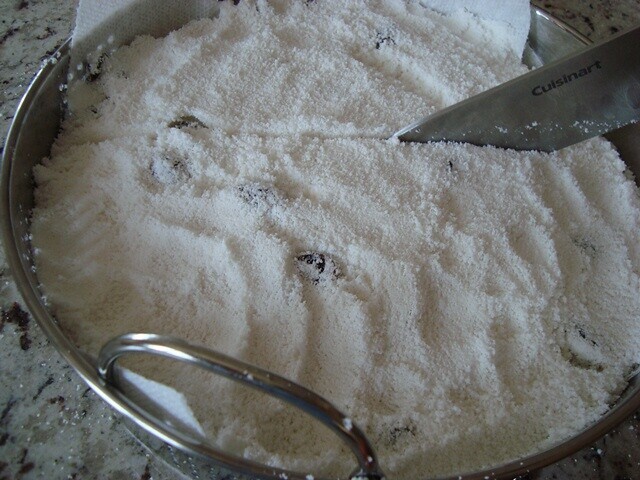 My mom didn't have anything on hand but white sugar on this particular day, so that's what we used. 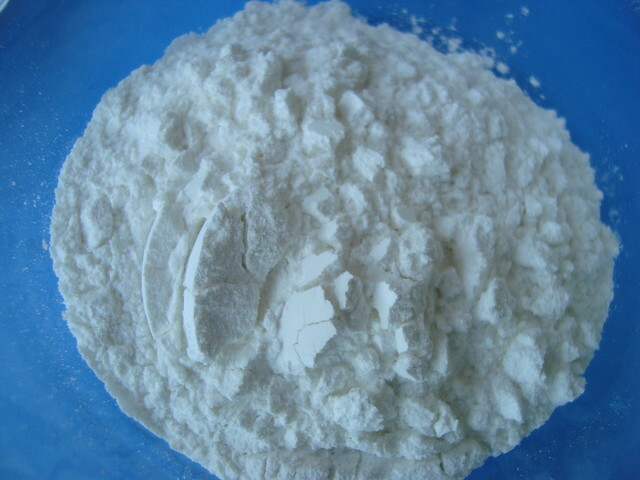 Any natural powdered sugar is fine to use as a substitute. 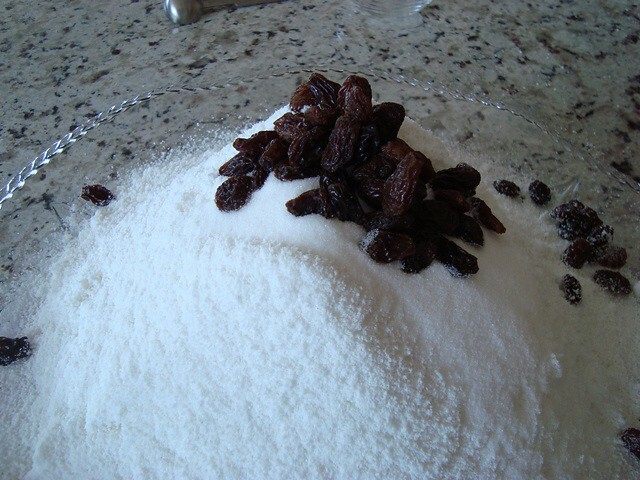 Or you can skip the sugar and use a few more raisins for sweetness. You'll also need about half a cup of water, a good steamer (the kind where the steaming basket is built to fit right into the pot), a high quality paper towel (Bounty works best), and a clean dish cloth. Some folks don't add sweet rice flour. 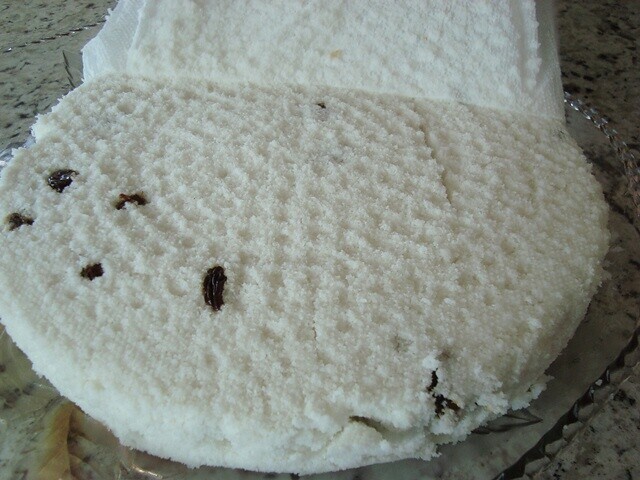 My mom likes to add it to give her rice cake the perfect amount of chewiness. 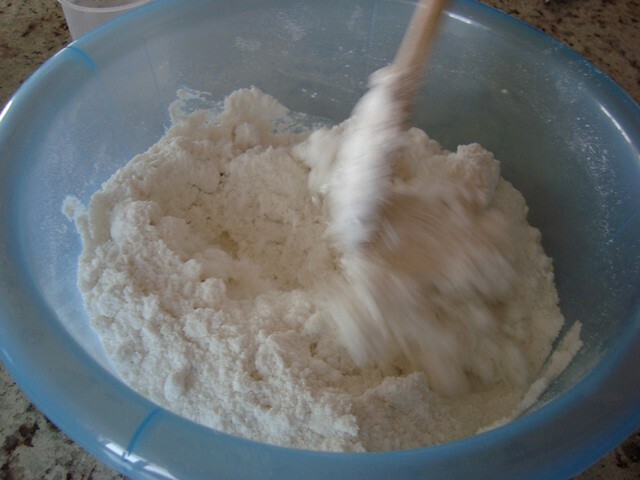 Adding just a couple of tablespoons of sweet rice flour also prevents the rice cake from crumbling easily with every mouthful. It's really quite easy. 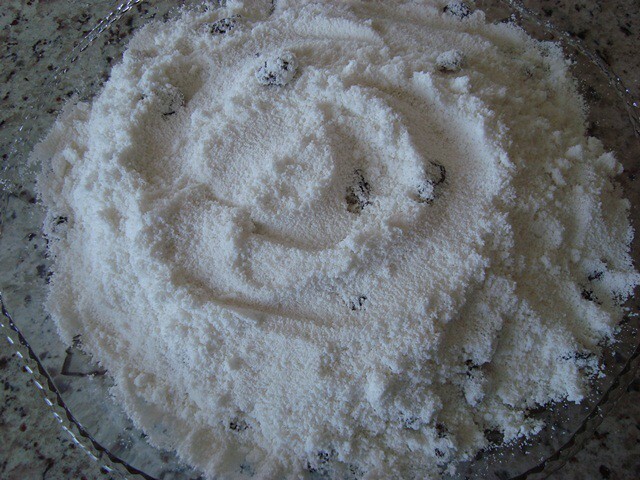 Start by combining the rice powder and sweet rice flour in a large mixing bowl. 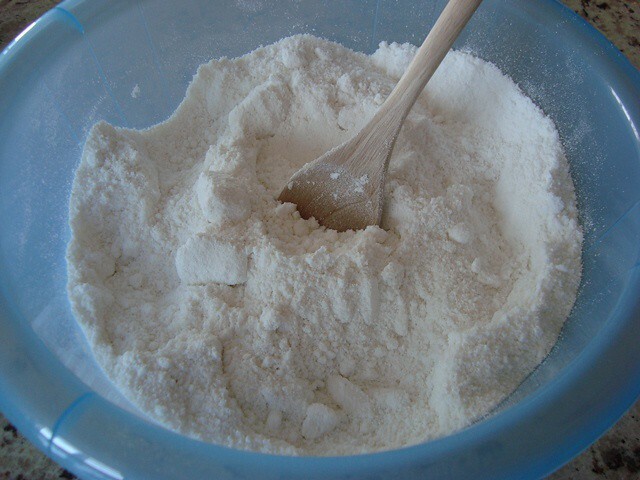 Give the rice powder and sweet rice flour a good stir to evenly distribute the two ingredients. Add half a cup of water in a slow drizzle. 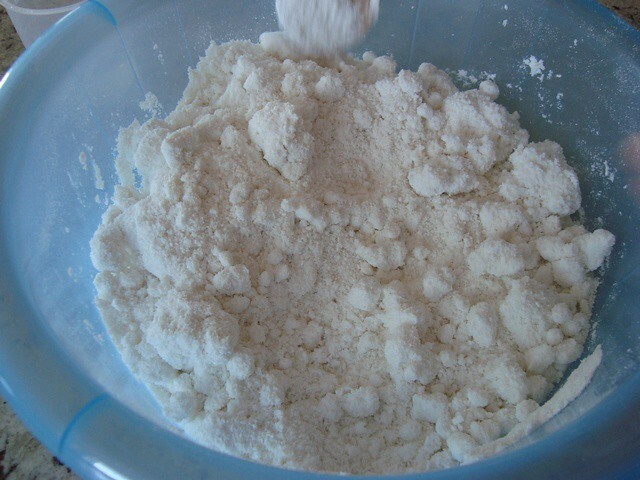 Stir and mix some more to allow the rice mixture to thoroughly absorb water. 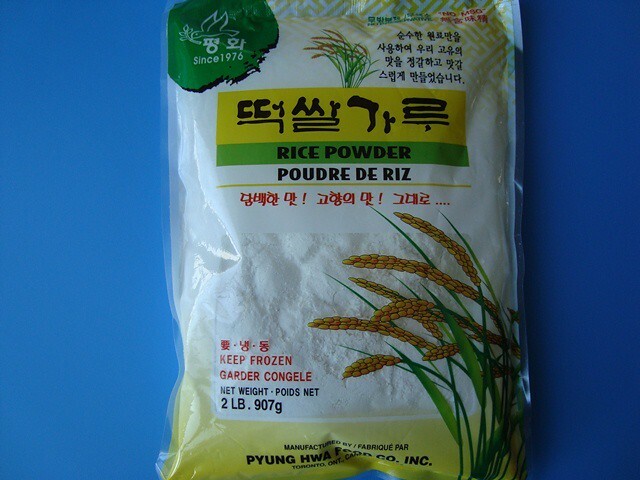 Now, you could start steaming this up right away and end up with a rudimentary Korean rice cake, but to create authentic rice cake that'll have your old school Korean friends truly impressed, you must take what you have and sift it through a strainer. 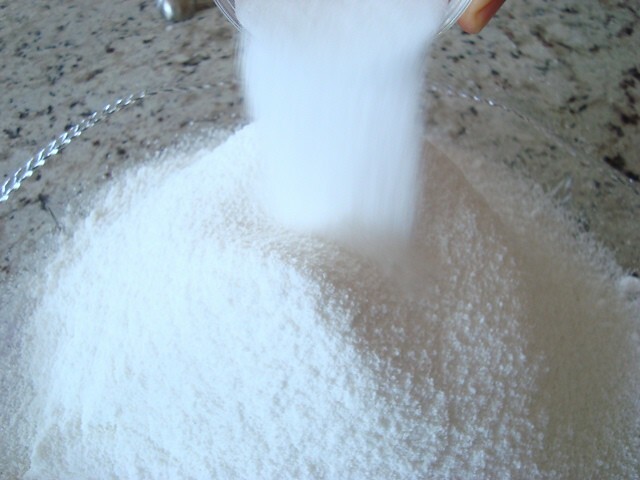 Don't be shy and get right in there with your hands to push every last bit of the rice mixture through the strainer until you have a small mountain of refined rice cake material. 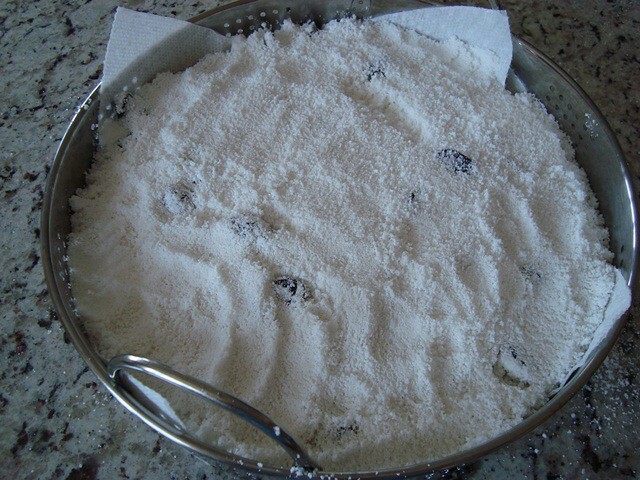 Now give things a light mix to evenly distribute raisins and sweetener. 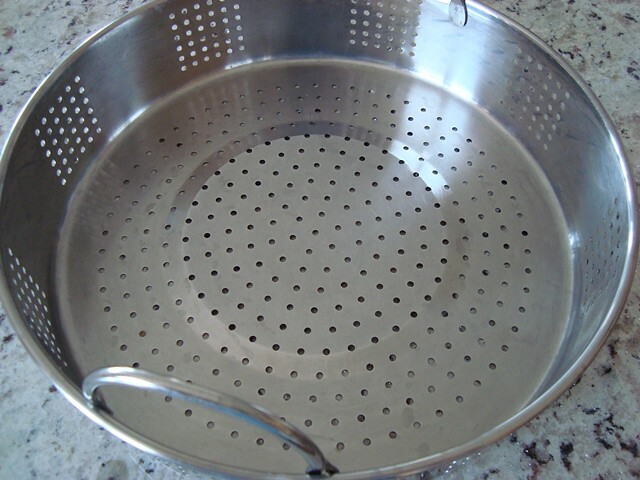 Time to prepare the basket of your steamer. Line your steaming basket with a layer of the best quality paper towel that you have access to. My mom swears by Bounty. 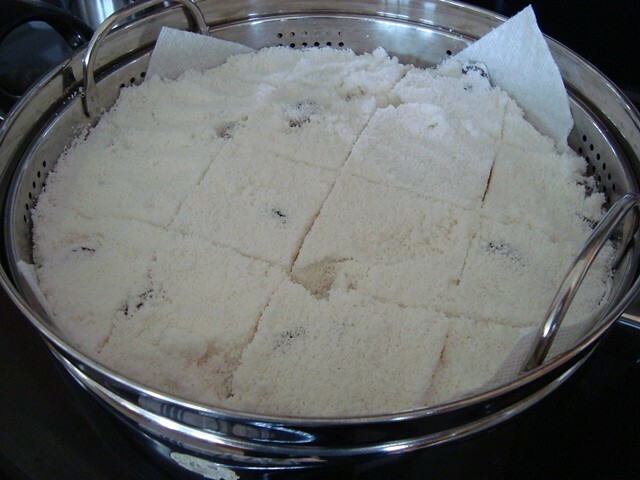 An aside: the purpose of the paper towel is to prevent the rice cake mixture from falling through the holes of your steaming basket. You could use a cheesecloth or even a clean J cloth, but doing so will lead to a solid hour of cleaning afterward to get your cloth clean. 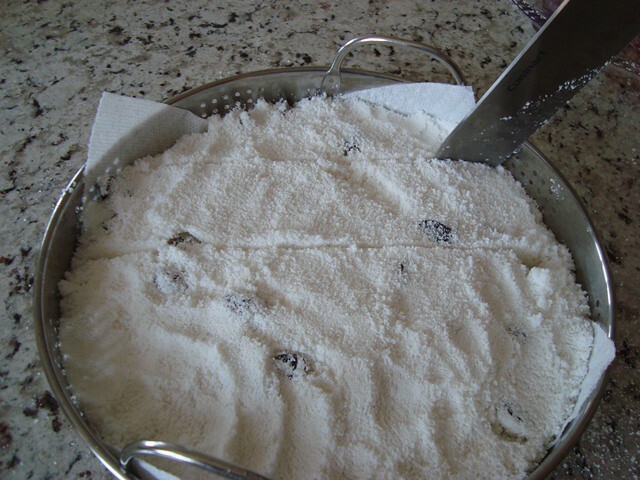 With a strong layer of paper towel, after you're done steaming, you can just peel the paper towel off, put it in the compost, and dive into your rice cake. 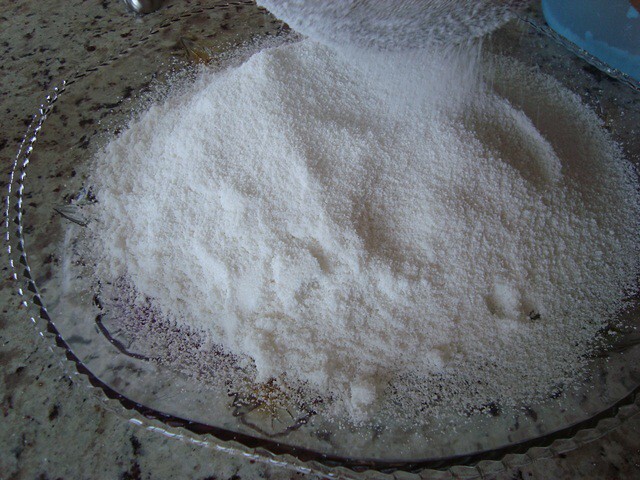 Once your steaming basket and paper towel are ready, transfer your rice cake mixture into the basket. And now the brilliant move that I bet even many Korean grandmothers out there who have been making rice cake for decades will appreciate: pre-cut the mixture into serving portions. Cutting before steaming results in much cleaner cuts - a wonderful discovery my mom made a few years back. 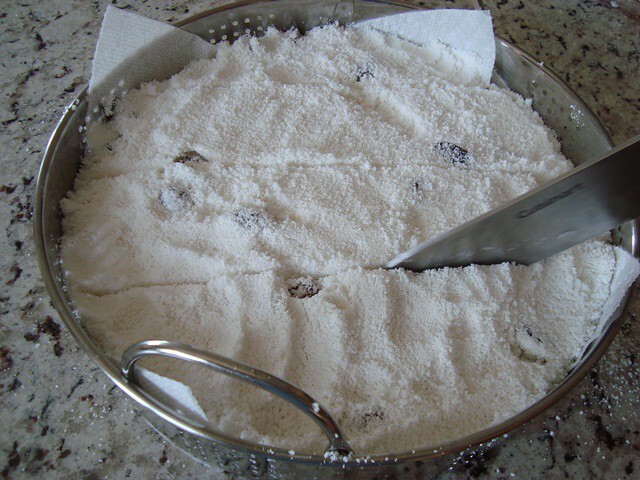 Now transfer your basket of pre-cut Korean rice cake to your steaming pot. 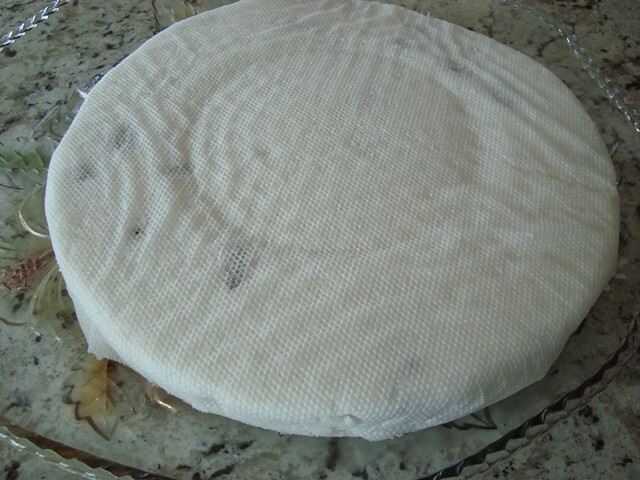 Cover with a clean dish or tea cloth. 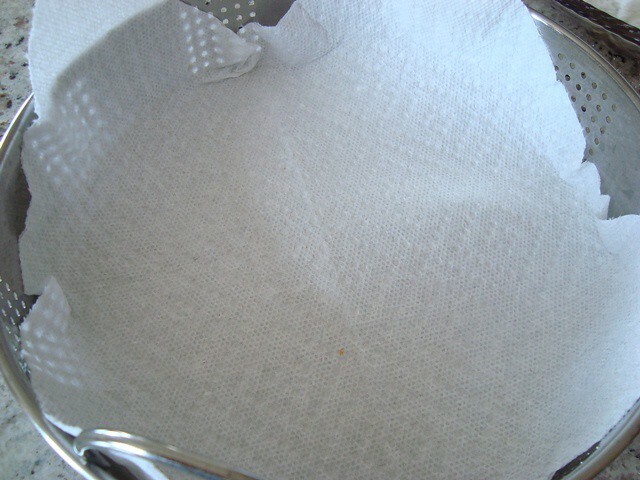 The dish cloth is necessary to prevent water from building up on the underside of the lid and falling back down on the rice cake while it's cooking. 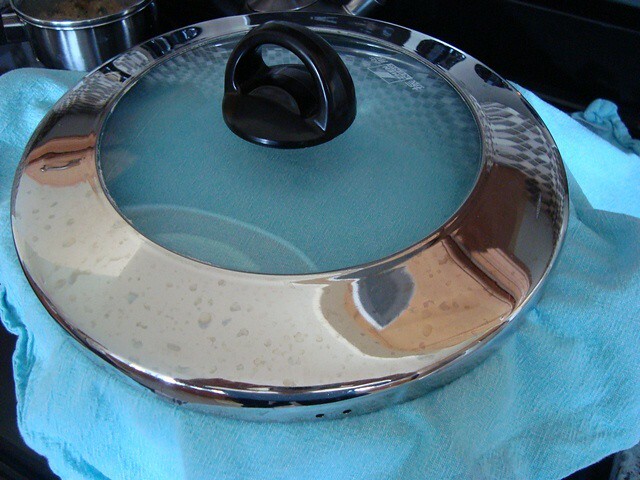 Cap the steamer with its lid. 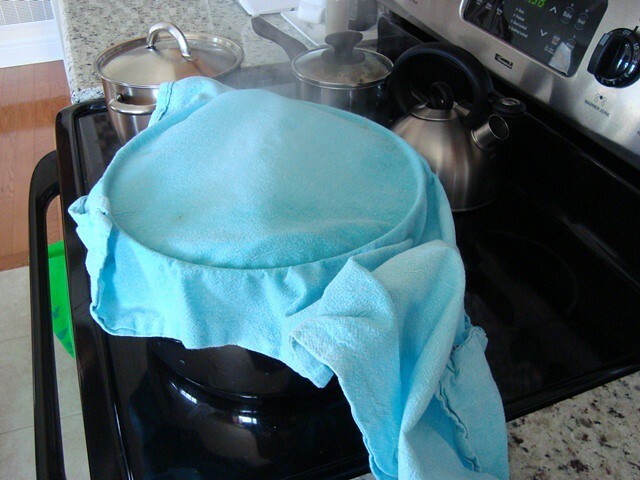 If you have some dish cloth hanging off to the side, to be safe, just wrap it up and over the top of the lid of your steamer. Now relax and let your rice cake take form in the steamer for forty-five minutes. You'll know it's done when you can poke a chopstick or fork into the center and have it come out clean. Give it about fifteen minutes to cool off, then flip it upside down onto a serving plate. Carefully peel back the paper towel. And there you have it, authentic, homemade Korean rice cake. 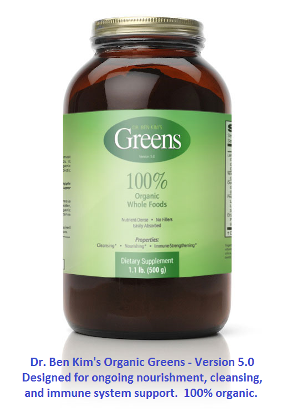 It's gluten-free with no added oils, margarine, or butter. It's chewy and as sweet as you'd like it to be (controlled by the amount of sweetener and raisins you choose to add). It's tantalizingly good when hot, but still highly satisfying as a room temperature snack. Within a few hours of making your Korean rice cake, be sure to put leftovers away in an air-tight container to maintain freshness and chewiness. You can even freeze small portions in saran wrap and bring them out as you need them; just a few hours of thawing, and they're close to being as good as they are fresh out of the steamer. If you don't enjoy raisins or you'd just like to try something else for texture and flavor, you can add a similar amount of cooked beans. Traditionally, Koreans have used red or black beans. But you should feel free to add whatever you please. If chickpeas or navy beans are your thing, give them a go. Just be sure that whatever legume you add is pre-cooked, since the short steam that the rice cake goes through won't be enough to cook dried legumes. 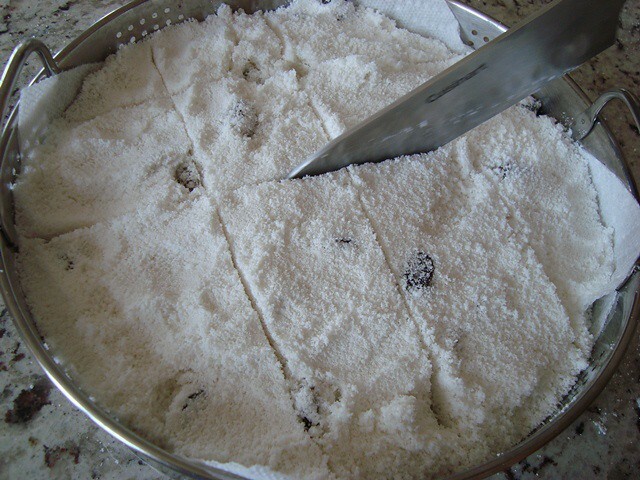 And that's our look at how to make authentic Korean rice cake (dduk). I hope that I've done my mom's recipe justice, and that you get a chance to try it. My wife and I both love korean food. She really likes dduk, especially in that snack popular with children, Dduk bok gee. I never enjoyed its bland chewiness. But the factory made, commercially available dduk that I have eaten looks nothing like what your mom made here. This really looks delicious!! I hope to try it soon. Seeing your recipes, especially as made by your mom, makes me acutely aware that us non-koreans who only eat korean food in restaurants, are really missing out on the best that your cuisine has to offer. Also, your mom sounds like a very nice lady. All the best! You know I've been waiting forever for this recipe with pictorials!!! My kids will be so HAPPY that Mommy can now make rice cake at home without having to go to H-Mart to get it (although they love H-Mart)! Yes, Amy, I know that you've been waiting a long time. :) Sorry, and thanks for your patience! I hope this pictorial doesn't disappoint. So kind of you to share these recipes. The recipe looks great and I love the tutorial photos. But I wish you'd shown us a piece of the cut rice cake and the texture inside once it's done!